We’re in Antalya each year at the same time – March – for the Runatolia event so these photos of our ambles through Karaalioğlu Park have been taken over a few years, in the same month. It’s just a lovely place to be, and, hopefully, these photos will show you why we love it so much. Not a bad way to enter a park, is it? We always stay in Kaleiçi when we go to Antalya and one of the entrances to Karalioğlu Park is just as you exit the old town. From here, you can take in Hıdırlık Tower. This tower has stood here, overlooking the Mediterranean and the ancient harbour since the Roman period; 2nd Century. The tower is cordoned off at the moment but just its setting is enough to force even the laziest of photographers to take out their camera. Wouldn’t you agree? One of the other entrances to Karaalioğlu Park is from the Işıklar neighbourhood just east of the old dwellings of Kaleiçi. At the top of this street, there’s a great coffee shop that serves snacks. There’s also a pub that we’ve been known to enjoy a beer (or few) and a burger in after our run. After that, you can amble down this pedestrianised walkway, via trees and water features towards the views ahead of you. From here, the Beydağları mountain range, beyond the gulf, looks colossal. In 2017, the route for the Runatolia 10K run was changed to take in a bit more of Antalya city centre’s amazing scenery. Running down this stretch towards the sea and the snowcapped mountains was a definite highlight of the route, even if the left turn towards the exit (see photo below) was a bit of a tough pull uphill. The sea views and palm trees kept me – and no doubt everyone else – going, though. Sometimes, you will have Karaalioğlu Parkı almost all to yourself. But just take yourself there on a sunny springtime afternoon on a Sunday. 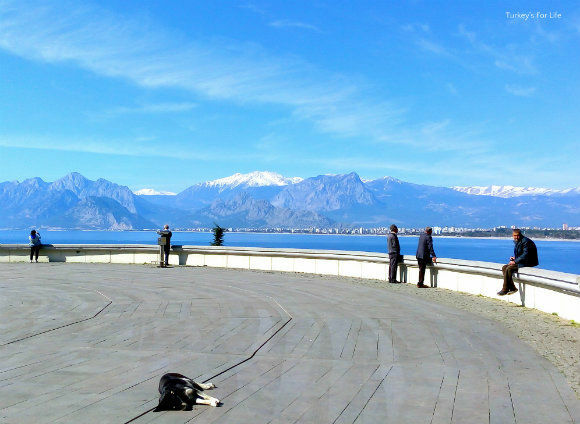 This is what makes this Antalya park so special for us (as well as the views, which we’ll come to shortly). If you’ve read our previous posts about our Antalya city centre experiences, you might remember we’ve struggled with this city in the past. We couldn’t get with it. It just wasn’t happening for us – but we’re not ones to give up either. We knew we must be missing something. We need local life and daily happenings and it’s only annual trips – due to the run – that have given us the time and the chance to spy all that. And, as a result, kind of fall for Antalya. This is what we’d missed. Karaalioğlu Park on a sunny Sunday. 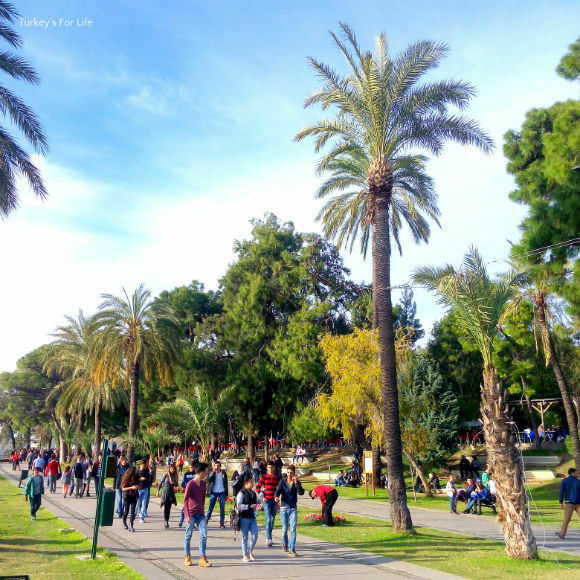 Packed with young people – Antalya has a huge student population – either just enjoying the space and the tea gardens, or using it as a ridiculously beautiful thoroughfare between Kaleiçi and the bars, cafes and shops of Işıklar. These are our happy times in Antalya. And why wouldn’t they be? People strolling through a park, people enjoying the cafes, a few guys taking the opportunity to entertain passersby with a bit of busking. There are worse things you can be doing on a Sunday afternoon! Yeah, so if you want to see a bit of Antalya-style chillout and park life, Karaalioğlu is the place to be on a Sunday. Just look at this! The photo above is from a visit a couple of years ago. A storm a comin’. But seriously, why would you not want to be stood in Karaalioğlu Park looking out to sea, watching that storm approach. And see that boat, there? They’re the boats that leave the harbour at intervals throughout the day, year round. They make their way along the rugged coastline to the beautiful Düden Waterfalls. 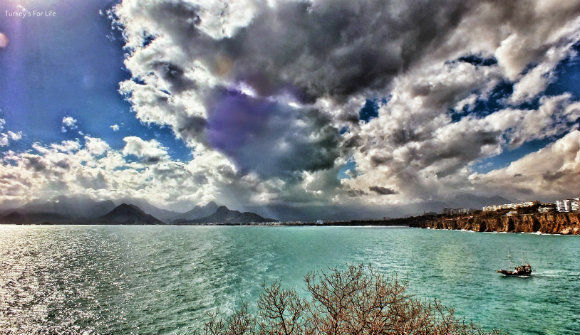 If you’ve got the right clothing, the weather’s looking only a tad menacing (March in Antalya can be mixed) and you’ve got these views, well you’re not going to skip out on Karaalioğlu Park, are you? 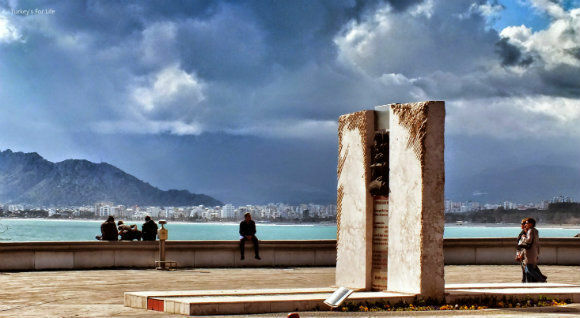 Sculptures and monuments with an angry, cloudy Mediterranean backdrop – stunning! Even on Google Maps, the pin has the description of ‘sweeping views.’ And the thing is, Karaalioğlu Park is right there, in the city centre. If you’re staying in Lara, you’ll need a bus. If you’re staying at the Konyaaltı Beach end, it’s a picturesque walk along the harbour. Or you can jump on the historic tram (a lovely trip). If you’re staying in Kaleiçi, or nearby, well hey, just head towards the sea. You’ll get there eventually. On a quiet morning stroll, it’s just you, the sleepy street dogs and a few other local strollers, taking in the views away from city life. This area (above) is probably the most popular of the viewing points. It’s a place to take photos, a place to just have a minute and gaze out to sea and over the mountains. Just out to the south west is Kemer, our set off point for our Lycian gület cruise. The Beydağları are the kind of mountain shape that kids draw. The kind where you think, “Hmm, mountains don’t really look like that.” Except, these mountains do. They’re mesmerising. They’re the sight that, as our Fethiye to Antalya bus rolls into the city each year, we know, yes, we’re back in Antalya. Ahh, Turkey. Official viewing platforms so you can sit or stand and take in the vast, sweeping views from Karaalioğlu Park. But you’re always going to get some of the youth who want their own little space, perhaps where they ought not to be. I mean, you can’t blame them, can you, with views like this? Clambering over the barrier to this wall, beer in hand. 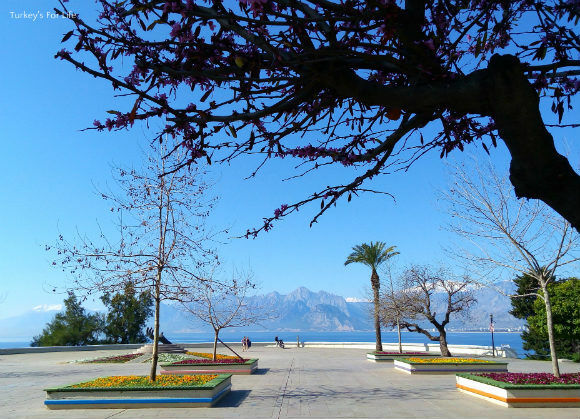 Antalya In Bloom is a common theme in springtime around the whole of the city centre and Karaalioğlu Park is included in that. There’s a lot of concrete and geometric design going on in the park, but, with the natural surroundings and the vibrant colour of the blooms, it works. The big tree in the foreground of this photo is a Judas Tree, so named as it’s the type of tree under which Judas was said to have betrayed Jesus. In early spring, it’s just coming into bloom with purple blossom. The tree is the symbol of nobility and power as well as the herald of spring. ‘Nobility and Power’ is the symbol because the purple of the blossom is that which was used for the clothing of monarchs during the Byzantine era. The dye was difficult to extract so, clearly, you had to be a person of wealth and importance to get your hands on it. And how do we know this? Because there’s a helpful little information board next to the tree, of course. 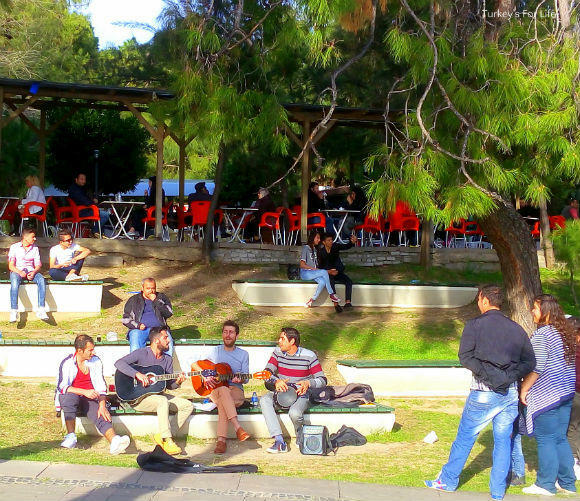 Karaalioğlu Park is somewhere where you can while away a good few hours if you’re the type of person who loves to sit in a cafe watching the world go by. 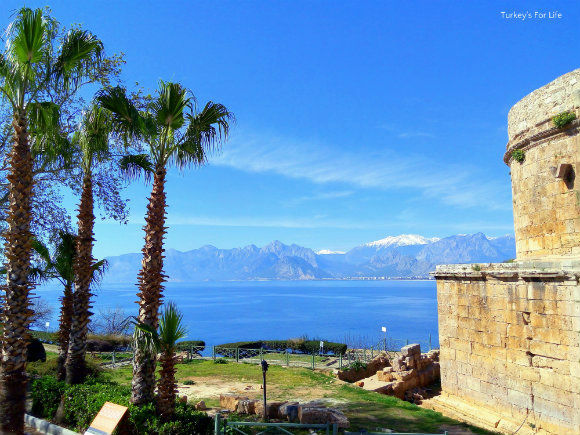 It’s also a thoroughfare and a place from where to view the full glory of Antalya’s coastal scenery. It’s our first port of call each time we visit. Well, okay, maybe our second one. Sometimes the draw of a cold beer wins. Once you’ve had your fill, you can head out of the park at Işıklar and follow the ancient city walls, passing Hadrian’s Gate, back towards the harbour. Or, you can do what we love to do. Go and get yourself lost in the maze of streets of the old town, Kaleiçi. Don’t worry! If you get lost, there’s plenty of bars and cafes to keep yourself refreshed and fed.